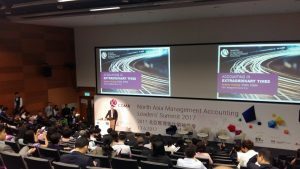 The highly anticipated North Asia Management Accounting Leaders’ Summit 2017 was successfully concluded yesterday in LT1, Cheng Yu Tung Building at the Chinese University of Hong Kong (CUHK) Business School. There were more than 20 opinion leaders representing the fields of enterprises, academic and research institutes from the North Asian countries and regions such as Hong Kong, mainland China, Macau, Taiwan and Japan. They delivered impressive speeches and collectively discussed the development and future of the current situation and vision of management accounting in North Asia at the summit. They alongside shared their insights from a wide range of perspectives and promoted professional excellence in management accounting. Featuring with various dialogues, keynote speeches and panel discussions, the summit uncovered insights from a wide range of topics including application practice and experience sharing of management accounting in different public fields and business circles, analysis to industrial standards and popularization of newest academic achievements. 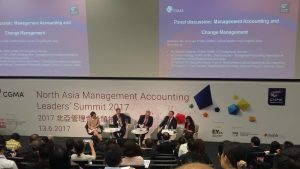 The summit also discussed many hot topics in current management accounting field including management accounting and change management, empowerment through technology with the presentation of Robotic Process Automation (RPA), leadership and sustainability. It is clear that technology will help companies, people and organizations automate processes and create more value for everyone in the future.